If you are either a fan of Arrow the television show or Green Arrow the comic series, you have met Shado. In Arrow she was the object of Oliver and Slade Wilson’s affection and the daughter of the imprisoned general who helped Oliver when he first arrived on the island. In the New 52 Green Arrow, she was a skilled warrior and the mistress of Oliver’s father, for which the two had a child Emiko. In the original DC continuity pre-New 52, she was a skilled assassin who was sometimes an ally to Oliver, sometimes an adversary. 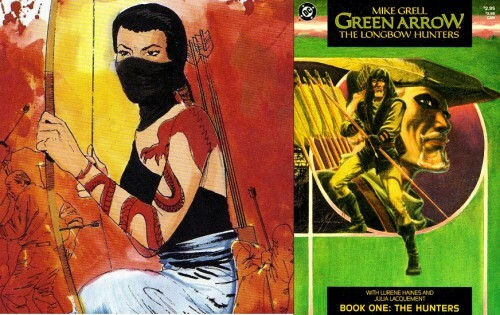 It all began in Green Arrow: The Longbow Hunters #1. Shado’s origin originally began as the daughter of a Yakuza agent who was sent to the United States with a large amount of money to set up Yakuza operations there, before World War II. After the war began and when the USA entered, Shado’s father was placed in a Japanese interment camp. A group of soldiers learned of his Yakuza ties and tried to torture him for the whereabouts of the money he was given by the organization. He withstood and would not tell them anything. However, years later the soldiers decided to seek him out once more. By then he was married and had Shado, so the soldiers tortured his family until he finally revealed where the Yakuza’s money was. Her mother died from the torture and her mother committed Seppuku because of the incident. While she has no super powers, Shado grew up and trained to take revenge of the soldiers who destroyed her family. She became an expert in martial arts and an expert marksman. Her quest for revenge eventually brought her to cross paths with Oliver Queen in Seattle as they both sought to bring down a serial killer in her first appearance. In Seattle someone was wandering the streets nightly and killing prostitutes, named the Seattle Slasher. Oliver and Dinah Lance had just moved to Seattle together, so Oliver pulls out his Green Arrow costume and begins investigating the murders. Oliver finally is able to find the serial killer, but he was not the only one tracking him. We are introduced to Shado for the first time, with bow and arrow drawn. The Seattle Slasher is ready to kill again, and as Oliver rushes to stop the murder, Shado shoots and kills the Slasher. Just as quick as she appears, Shado disappears before Oliver can see her. This is just the beginning of their soon to be, complicated, relationship.